5Doc. Dr., Tepecik Eğitim ve Araştırma Hastanesi, Göz Hastalıkları, Izmir, Türkiye Aim: To evaluate central corneal thickness (CCT) of cases diagnosed with central and hemicentral retinal vein occlusion by using anterior segment optical coherence tomography and to compare them with healthy volunteers. 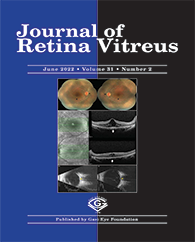 Methods: 50 cases diagnosed with retinal vein occlusion(Group 1) and 50 healthy volunteers(Group 2) were included in our study. All patients underwent standard ophtalmological examination. Central corneal thickness (CCT) of all cases were measured with SD-OCT (Spectralis OCT,Heidelberg Engineering, Heidelberg, Germany). All analyzes were performed with the SPSS 22.0 package program. (p <0.05 was considered statistically signifi cant).